In the Spring of 2005, the ladies of Zeta Psi Pi Local Multicultural Sorority were approached by the Director of Greek Affairs at the University of New Mexico (UNM) about the opportunity to be part of a National Organization. After researching various organizations, Founding Sister Figueroa-Gonzales and Moya presented Theta Nu Xi Multicultural Sorority, Inc. to the ladies of Zeta Psi Pi. These women were fascinated by the beauty, scholarship, tenets and diversity held by the Women of Theta Nu Xi (TNX). During that presentation a unanimous decision was made to contact Theta Nu Xi about expansion to UNM. At the first interest meeting, the ladies of Zeta Psi Pi were joined by Founding Sister Avitia to discuss the possibility of bringing TNX on the UNM campus. 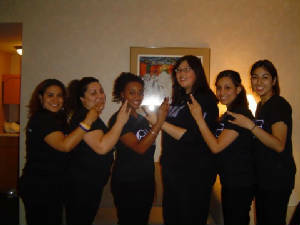 On May 2nd, 2005 after much commitment and devotion, “Quintessential Destiny” comprised of Founding Sisters Amanda Ophelia Figueroa-Gonzales, Michelle Marie Moya, Chasity Alexis Long, Margarita Avitia, and Samantha Rae Koike became the Precious Psi Colony of Theta Nu Xi Multicultural Sorority, Inc. Continuing with great ambition the Psi Colony at UNM officially became a Chapter of Theta Nu Xi Multicultural Sorority, Inc.on February 26, 2006.